In conjunction with 100 years of International Women’s Day, and in celebration of the artistic grace of women, Kakiseni presents “Women: 100”: a hundred hours of performing arts across Malaysia in tribute of women. Starting from 8 March 2011, Kakiseni, along with a host of local venues and the Ministry of Women, Family & Community Development will showcase a series of performances inspired by women - their stories, thoughts, experiences and the issues that revolve around them. Kakiseni believes in no better vehicle than the performing arts to communicate the strength, beauty and struggle of women to the public and hopes that these ideas will resonate deeply through the use of such familiar and popular media as music, dance, theatre and workshops. Whilst being a celebration of women’s achievements, Women: 100 also have the wider goal of empowering women to create, dream, and operate beyond the bounds of the status quo. As such, Women: 100 will be pushing a set of seven commitments aimed at making Malaysia a better place for women. The MANifesto and the MAXim will engage both men and women in a series of tasks that address issues commonly-faced by women. Both genders must work together to accomplish these tasks, sharing their accomplishments via the use of social media, and in so doing, Women: 100 hopes to stimulate healthy and productive discussion of women’s issues. In today’s world, women’s suffrage is firmly entrenched as a right by the United Nations and many countries have adopted legislation that accord women every right that their male counterparts are entitled to. Yet, while laws and regulations are one thing, concrete and enduring change requires a shift in attitudes from the ground up. Will you make that change? Will you be that change for the women that you treasure and love? Participate in “Women: 100”! Sign it, Share it, Do it! I have Sign it! Have you? You can do so at http://manifesto.my/ ! Sign It. ! Enjoy the FlashMob's photos and video below! Cheers! 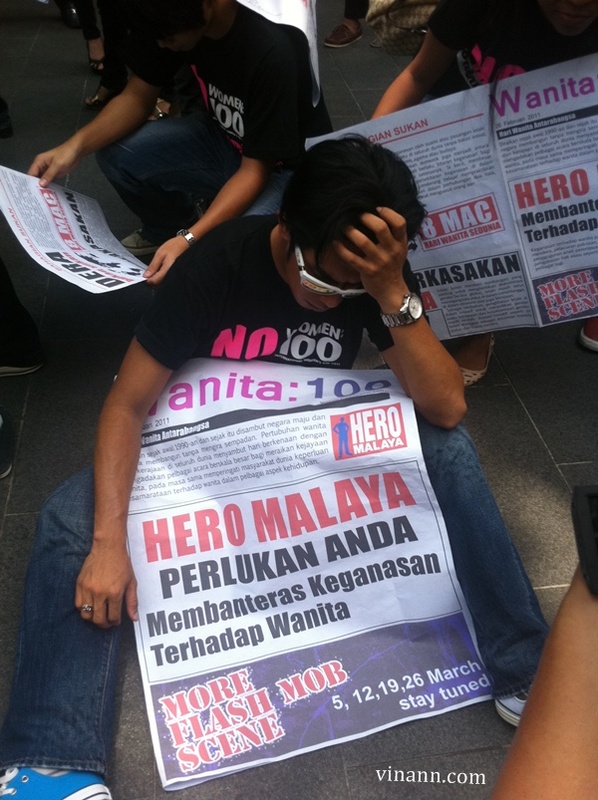 Hero Malaya need to against Abuse!